One of the world's largest stalagmites dominates the main chamber of the Cathedral Cave near Wellington in 2009. Australian scientists said Wednesday cavers had stumbled upon a vast network of tunnels containing fossils that could offer key insights into species' adaptation to climate change. Australian scientists said Wednesday cavers had stumbled upon a vast network of tunnels containing fossils that could offer key insights into species' adaptation to climate change. The limestone caves in Australia's far north contained what University of Queensland paleontologist Gilbert Price described as a "fossil goldmine" of species ranging from minute rodents and frogs to giant kangaroos. Once part of an ancient rainforest, the remote site now lies in arid grassland and Price said the fossilised remains could hold key clues about how the creatures had adapted to climate change and evolved to their current forms. 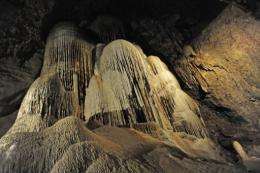 The caves' oldest specimens are estimated to be 500,000 years old. Price said they lived in a period of major aridification of central Australia and retreat of the rainforest that triggered a "formal extinction event". "What we're trying to do up here is really look at the fossils and look at the animals and see how they responded to those prehistoric climatic changes, and that's something that's really quite relevant to today," Price told AFP. He said the caves could serve as an important benchmark to contrast modern relatives against, to understand how they had evolved. "We've got the question of what the effect of modern climate change is going to be on the organisms that we have around us, and the reality is we just don't know because we don't have any significant period of ecological sampling of the modern faunas," said Price. "Just having an understanding of how they responded in the past is incredible, it's something that we can use and plug into models for conservation going into the future." The smaller creatures were thought to have been carried into the cave by a predator such as an owl, while the larger ones, including a 2.2-metre (7.2-feet), 180-kilogram (396 pounds) mega kangaroo, probably tumbled into it through a hole. It is slow work, with access to the caves difficult and time-consuming. Price said it would take a year to work through the 120 kilograms of fossil-rich sediment they had managed to carry out of the site on foot so far. Local cavers had uncovered more tunnels in the past week alone, each producing "something of significance" and Price said there was "potentially many lifetimes worth of work in the area". DNA sequencing! Some of the fossils should be possible to sequence, the Max Planck institute has a team that sequenced the Neanderthals. Wow, I wonder what else they found in there. I cannot believe no one had found the tunnels before though, wouldn't you want to explore and map out the cave when you found it?